Don’t Touch The Spikes is a free arcade game for Windows 8 and 8.1 computers. This exciting new game for Windows 8 is an alternative for the famous Android game, which has the same name: Don’t Touch The Spikes. Developed by CTY Studio, this game is no less than the original one. With four different game modes, this game is an amazing addition to the Windows games collection. Save the fish from spikes, and keep it alive for as long as possible. 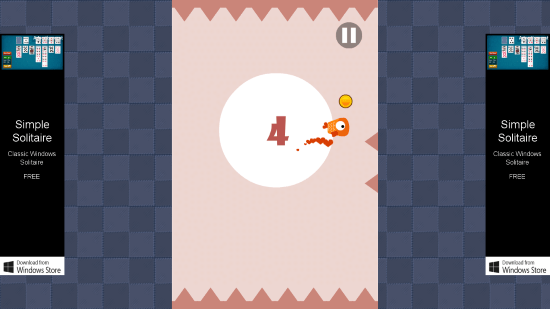 Collect coins and gems as you play this game, and use them to upgrade the game. Go to the Windows App Store to find this game. Search for “Don’t Touch The Spikes” in the search box. You can also click on the installation link at the end of this article. Click on Install, this free arcade game for Windows 8 will get downloaded and installed automatically. With a size of just 3.75 MB, it does not even occupies much space on your computer. This is a fun to play arcade game for Windows 8. The gameplay is similar to the gameplay of the original game. 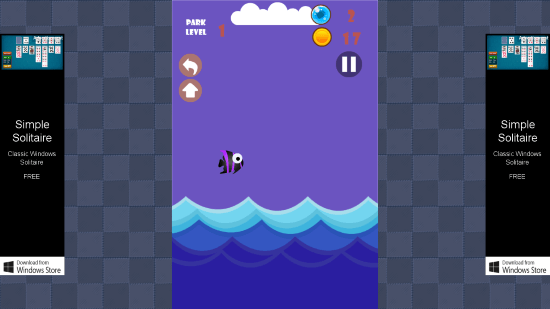 Tap the screen to make the Fish jump. 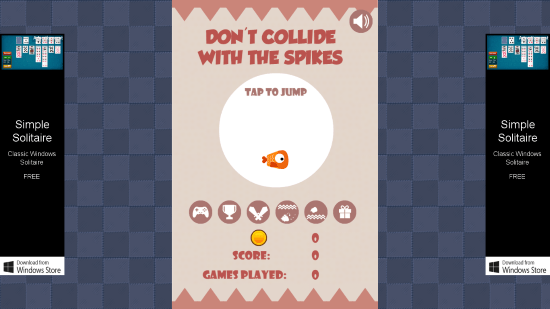 You have to make the fish jump in a way, that it does not touches the spikes. The Top and bottom spikes are fixed, but the spikes from both the sides of the wall are surprise. They appear unevenly, and you have to make sure that the fish does not touches it. All of this needs to be done while collecting points. Coins appear at random places. Collect the coin to make high scores. To make this arcade game for Windows 8 more exciting, 3 more modes have been included. The next mode is Challenge Mode. In the same arena one more fish joins you. The other fish is a bot. You have to survive and stay alive for more time than the other fish. There are 3 rounds, the fish with more wins, wins the challenge. Explorer Mode is the most challenging and exciting mode in this arcade game for Windows 8. The arena is dark, and you have a torch fish to play with. 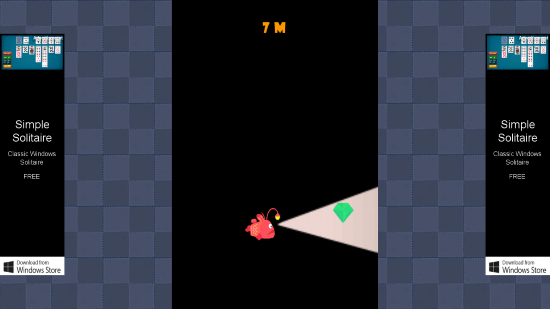 Start playing this game to discover the Gems and Spikes with the help of light. The light sprawls a limited area, so you got to be really careful. Enough of playing as a fish? Now hunt fishes in this Hunt mode. 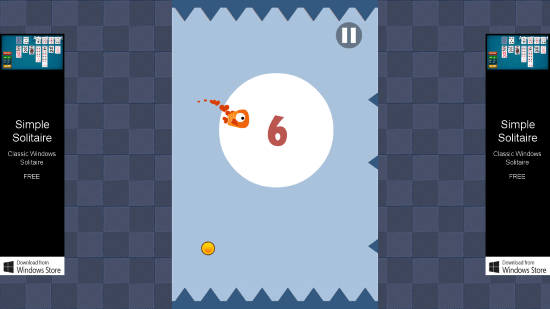 The fishes jump out of water in this mode, all you have to do is click on the fishes while they are visible. Kill the fishes, and collect their eyes as points. This game can be a very interesting and exciting addition to your Windows 8 computers and tablets. The graphics are simple, yet pleasant. Download this super addictive game Don’t Touch The Spikes on your Windows 8 Computers and Tablets today.